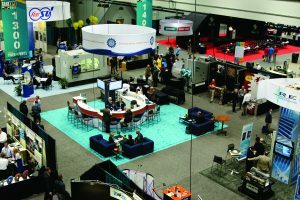 Sikorsky Aircraft, REM Chemicals, Alion Science and Technology, and others join forces to evaluate how the ISF process alleviates this failure mode in aerospace gears. The high performance required from aerospace gears places stringent requirements upon the metallurgical quality, geometry, and surface finish of mating parts. 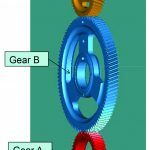 In an effort to meet their mission requirements, aerospace gears are often engineered to operate near the upper bounds of their theoretical design allowables. Due to this, scuffing is a primary failure mode for aerospace gears. It was previously shown that specimens having an isotropic superfinish using chemically accelerated vibratory finishing had an improved performance in Rolling/Sliding Contact Fatigue (R/SCF) testing. Isotropic superfinishing improved R/SCF resistance up to nine times that of baseline test specimens. These tests also demonstrated the ability to successfully carry 30 percent higher loads for at least three times the life of the baseline samples . A study was then conducted on actual gears having an isotropic superfinish. 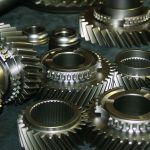 This study showed isotropic superfinishing technology increased a gear’s resistance to contact fatigue by a factor of three, and increased bending fatigue resistance by at least 10 percent . 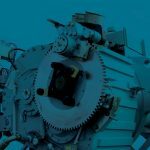 This increase in gear performance translates to reduced operation and sustainment costs, and also offers the potential for weight reduction in new transmission designs. 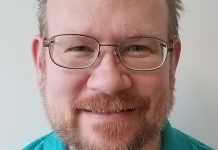 The present paper will discuss an additional study that is underway to determine and compare the scuffing resistance of isotropic superfinished aerospace gears to that of baseline ground gears. Sample gears were made from case carburized SAE 9310. These tests were conducted using a method that progressively increases lubricant temperature until scuffing occurs, rather than the traditional load increasing method used in FZG testing rigs. The results of the current testing reveals that isotropic superfinished SAE9310 specimens show at least a 40°F higher lubricant temperature at the point of scuffing compared to as-ground baseline gears. Based on these results and the previous studies, it was concluded that this isotropic superfinishing technology should be incorporated in all future aerospace gear designs. A later paper will report on similar scuffing testing performed on AMS 6308 gears due to runouts achieved by both the baseline and isotropic superfinished samples during the current procedure. The high performance required from aerospace gears places stringent requirements upon the metallurgical quality, geometry, and surface finish of mating parts. 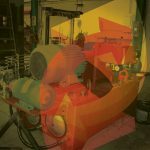 In an effort to meet these requirements, mating parts are often designed to operate near the upper bounds of their theoretical design strength envelope. 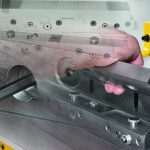 Precision grinding after heat treatment is a standard practice used in the aerospace industry in order to obtain the necessary final tolerances demanded by the need to provide higher power density levels without increasing component size or weight. Friction and wear between two sliding surfaces are in large part dependent upon the finish of the surface. In particular, the roughness of the surface has a strong influence on the coefficient of friction. 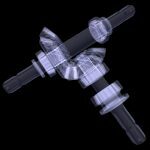 Overcoming friction, especially in high performance applications, involves stringent lubrication requirements. Examples of applications requiring exceptional surface finish include gears and bearings. 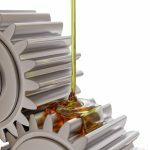 A new surface finishing technology, known as Isotropic Superfinish (ISF®), has proven to be effective at reducing gear wear, while at the same time reducing lubrication requirements. This revolutionary technology was developed for military helicopter applications as part of both the Instrumented Factory for Gears (INFAC) and Power Transfer Systems Manufacturing (PTSM) programs, sponsored by the U.S. Army Aviation and Missile Command (AMCOM) at Redstone Arsenal. 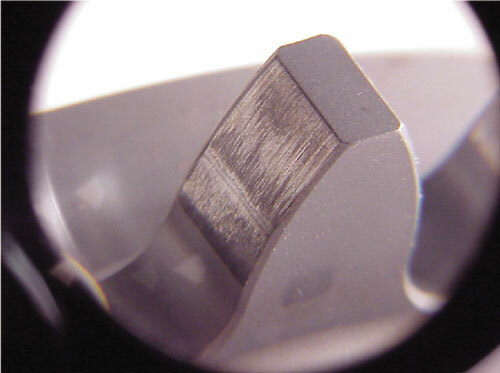 Initial testing performed by Alion Science and Technology Corporation (formerly IIT Research Institute), under the Army MANTECH program (DAAJ09-95-C-0546), demonstrated that the isotropic superfinish process improved performance in Rolling/Sliding Contact Fatigue (R/SCF) specimens. This testing revealed that superfinished samples yielded improvements of up to nine times the contact fatigue life as compared to baseline test specimens. Isotropic superfinished specimens have also demonstrated the ability to successfully carry 30-percent higher loads for at least three times the life of the baseline samples. These promising INFAC results led to the comparison testing of actual aerospace quality gears in both baseline (final ground) and isotropic superfinish conditions. This second project, conducted under the PTSM Program, was titled “Engineered and Superfinished Surfaces for Precision Aerospace Applications” (Manufacturing Technology Report, October 30, 2002, Contract No. DAAH23-00-C-R232). This project demonstrated the ability of isotropic superfinishing to increase a gear’s resistance to contact fatigue by a factor of three, and to increase bending fatigue resistance by at least 10 percent. This increase in gear performance translates to reduced operation and sustainment costs and offers the potential for weight reduction in new transmission designs. However, the effect of the isotropic superfinish process on scuffing resistance of gears remained unknown. This lack of knowledge was an obstacle to implementation of the process. Consequently, it was determined that data on scuffing resistance must be obtained. The isotropic superfinish process is a commercially available process that, when applied to helicopter transmission gears, can result in improved gear tooth bending and contact fatigue resistance as well as reduced noise, vibration, and operating temperatures  . 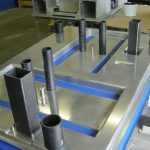 The isotropic superfinish process provides a uniform surface finish by reducing the peaks on the surface through the use of chemically accelerated vibratory finishing. 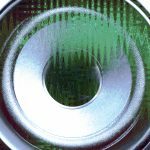 A detailed description of chemically accelerated vibratory finishing using high-density nonabrasive media has been published in the past . The following is a brief summary of the technique. The isotropic superfinish is produced in vibratory finishing bowls or tubs. An active chemistry is used in the vibratory machine in conjunction with high-density, nonabrasive ceramic media. When introduced into the machine this active chemistry produces a stable, soft conversion coating on the surface of the metal gears being processed. The rubbing motion across the gears developed by the machine and media effectively wipes the conversion coating off the “peaks” of the gears’ surfaces, but leaves the “valleys” untouched. No finishing occurs where media is unable to contact or rub. The conversion coating is continually reformed and rubbed off during this stage, producing a surface smoothing mechanism. This process is continued in the vibratory machine until the surfaces of the gears are free of asperities or until the surface attains the desired level of finish. At this point the active chemistry is rinsed from the part and the gears are dipped in rust preventive. 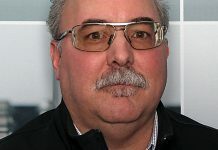 The Army ManTech projects discussed above have also shown that the isotropic superfinish process is robust and suitable for production environments. 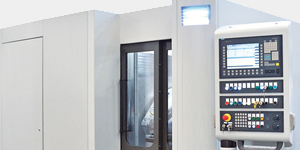 It does not require any unusual or financially significant unique tooling, fixtures, or equipment. The budgetary cost for a turnkey isotropic superfinish processing system is between $45,000 and $75,000. The gear performance benefits of this process, coupled with its suitability and affectability for shop floor use, supports additional testing of isotropic superfinish gears to help pave the way for implementation of the technology in Army weapon systems. 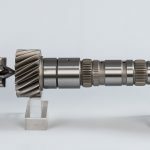 As such, Sikorsky Aircraft Corporation and REM Chemicals, Inc., teaming with the United States Army and Navy, conducted a 200-hour endurance test on the H-60 tail and intermediate gearboxes with the isotropic superfinish process applied to the bevel gears. Testing included documentation of noise and vibration levels, along with determination of the effects on gearbox temperature. Results of the H-60 tests are not publicly available at this time (AATD RDS-21 Program, Agreement Number DAAH10-01-2-0032). Sikorsky also ran an in-house test on an S-76C+ main gearbox final stage spur bull gear and mating two pinions that had been isotropic superfinish processed. Results show a 3.7 dB noise reduction for the second stage bevel gear, and a 7.0 dB noise reduction for the third stage bull gear (at 1 x bull gear clash frequency), and a 5°F drop in oil out temperature as a result. 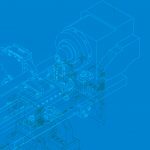 Additional testing is scheduled under the AATD RDS-21 and the Coating Enables High Power Density Transmissions (NIST) programs to further demonstrate and document the improvements in gear tooth life in bending and Hertzian contact. 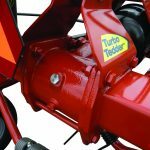 Gear tooth root surface finish improvement has been shown to increase the bending fatigue allowable. Isotropic superfinish for bearings will also be investigated under the RDS-21 program in the future. 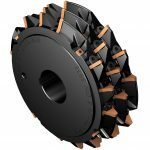 However, there was still a need for a program that would determine the scuffing resistance of the isotropic superfinish on gear tooth surfaces. With improved scuffing resistance criteria, new transmission designs with isotropic superfinish gears can be optimized for gear tooth strength and lubrication requirements, which will improve overall power density. The objective of this PTSM Project was to determine and compare the scuffing resistance of isotropic superfinished precision aerospace gears to that of conventionally processed baseline samples. Sample gears were made from SAE 9310 gear steel for this study. It was expected that this project would result in the quantification of the scuffing resistance of isotropic superfinished precision gears. It was further expected that the results of this project would lead to the implementation of the isotropic superfinish technology, if the scuffing resistance of the superfinished gears was shown to be equivalent or superior to those gears that were conventionally processed. Sikorsky Aircraft Corporation was responsible to fabricate a total of 24, 4-inch pitch diameter test gears, per the agreed upon drawing. Aero Gear Corporation of Windsor, Connecticut, was selected as the manufacturer to fabricate the gears for these tests. The test gears were manufactured to the specifications seen in Table 1. 1) Two spur gears (one gear pair) in a test rig were to generate two data points by utilizing both surfaces of the gear teeth. 2) Twelve data points were to be from baseline (final ground) test gear pairs. 3) Twelve data points were to be from isotropic superfinish test gear pairs. 4) All testing was to be performed at Pratt & Whitney Corporation in East Hartford using their 4-inch gear testing facility. 5) There was to be shared responsibility for writing the Manufacturing Methods Report. However, after the gears had been fabricated, problems developed with the gear test stand at Pratt & Whitney Corporation, precluding its use. 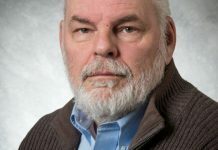 Consequently, Sikorsky Aircraft Corporation selected the Drivetrain Technology Center (DTC)-Applied Research Laboratory at Pennsylvania State University in State College to conduct the tests at their 4-inch gear testing facility. 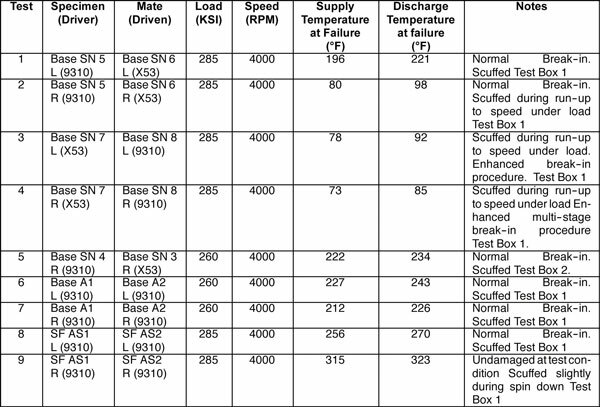 To perform the tests to the specified test plan, DTC requested a total of 17 gears of which six would be used for equipment setup, six were to be the baseline (final ground, and shipped directly from Sikorsky Aircraft Corporation), and five were to be final ground plus isotropic superfinish (ground samples were shipped from Sikorsky Aircraft Corporation to REM Chemicals, located in Brenham, Texas). It was determined by REM Chemicals that the as-received (final ground) gears were well within the specified maximum arithmetic mean roughness (Ra) of 20 min. 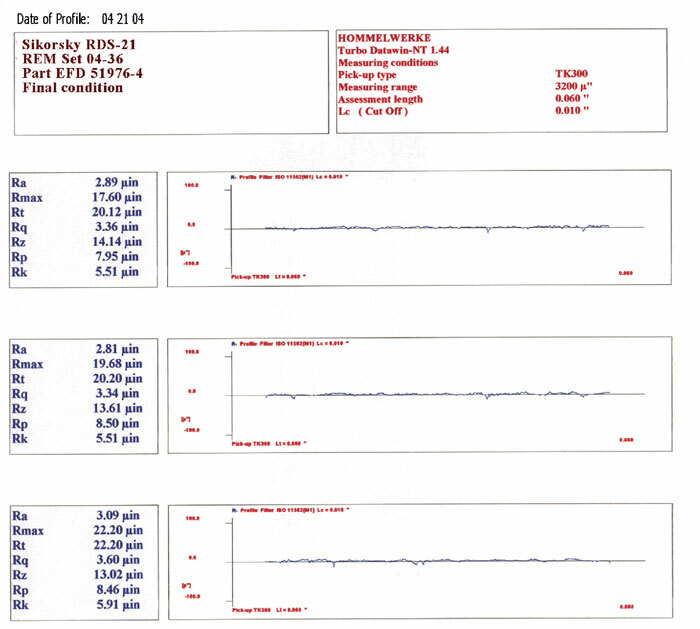 See Figure 1 for profilometer measurement results for three of the baseline gears. REM Chemicals isotropic superfinished the contact surfaces of the five test gears with the goal of achieving an arithmetic mean roughness (Ra) of less than 3.0 min. 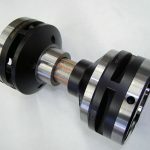 while maintaining a maximum stock removal of 0.00015 in. per surface. All five gears were processed as one batch in the same vibratory bowl. After isotropic superfinishing, the gears were measured once again to determine the final surface roughness. The values ranged from 1.9 min. to 3.09 min. Ra. See Figure 2 for the profilometer measurement results for three of the isotropic superfinish gears. The witness coupon used to monitor stock removal indicated that a total of 0.0001 inch per surface was removed during the process. Based on the small amount of stock that was removed to achieve the required Ra, it was anticipated that there would be no detrimental affect to the gear geometry. The five isotropic superfinish gears were forwarded to DTC. 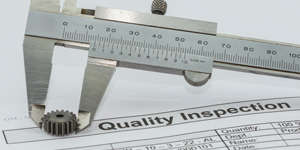 Upon receipt, DTC serialized the parts to establish identification for inspection and testing. Prior to testing, some of the gears were subjected to dimensional inspection by DTC. It was agreed that dimensionally inspecting one ground gear and one isotropic superfinish gear out of each lot would be considered representative of the remaining gears of that lot. Dimensional inspections for total pitch line runout, lead, pitch and spacing variation, and involute profile were performed. For the gears that were inspected, all tooth geometry parameters were found to be within blueprint specification. 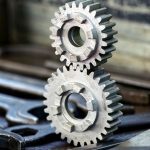 This demonstrated that the isotropic superfinish process did not have a significant affect on the gear geometry. Based on this finding, and on consistent results of previous work  , it was determined that more isotropic superfinish gears need not be dimensionally inspected. Both baseline (final ground) and isotropic superfinish gears were tested at DTC, using a method that progressively increases lubricant temperature until scuffing occurs. 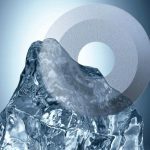 It was theorized that a significant scuffing resistance should be obtained based on the fact that under the testing conditions used, 4,000 rpm and 2490 in-lbs of torque, the calculated EHD Film Thickness is 6.0 min. Consequently, for any composite surface roughness below 6.0 min., the gears will have a film of oil between the mating surfaces. This reasoning was supported by the results of the testing. It should be noted that the DTC facility was designed with a test box (box 1) and a reversing box (box 2). The test gears were installed in both boxes so that two tests could be run simultaneously. See Figure 3 for a loading schematic for the four inch center distance test rig. The first test conducted after the rig was upgraded was a setup/shakedown test with one of the specimen gears fitted with a strain gage in a root fillet. The signal from this strain gage was passed through a slip ring assembly and monitored with a digital oscilloscope as the rig was run at various speeds. The results of that test revealed two issues that impacted this set of tests. First, there is a torsional natural frequency at approximately 3200 Hertz. Because of the nature of the profile modification on the specimen gears there is a strong forced vibration at twice the mesh frequency. 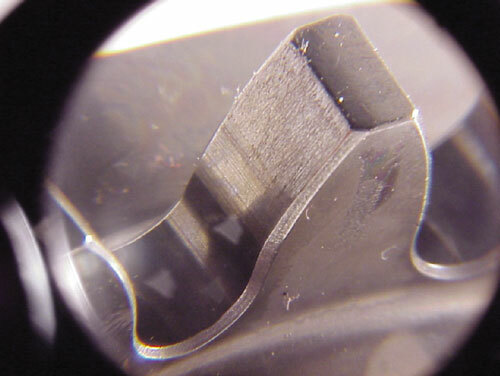 With the 20 tooth specimen gears used, these two factors caused a severe torsional resonance at approximately 4800 rpm. To avoid passing through this resonance while bringing tests up to speed, tests conducted for this effort were run at 4000 rpm. There was also a less severe forced vibration at three times the mesh frequency, resulting in a resonance at 3200 rpm. Detailed test procedures were developed to mitigate the effect of bringing tests up to speed through this resonance. The other issue revealed by the setup test involved the interaction between the gears at low speed. 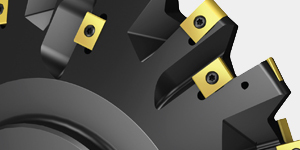 The profile modification on the 20 tooth specimen gears started with a hard knuckle at approximately 25 degrees roll angle and increased linearly with roll angle up to about 0.0015 inch at the tip. This resulted in approximately 0.0008 inches modification at 30 degrees roll angle. For this gearset to run smoothly, profile modification needs to be minimal (i.e., less than 0.0002 inch) at 30 degrees roll angle. Because of the excess modification at 30 degrees roll angle, the driving gear did not positively drive the driven gear through the entire mesh sequence; this allowed the two gears to skip against each other. The strain gage signals collected at 1500, 2000, and 2500 rpm during the setup test showed a high(er) frequency signal due to the gears skipping against each other superimposed on the signal due to the meshing action. Because of this situation, only limited testing was conducted at the lower speed. The results of these tests will be analyzed further to determine if future testing at low speed would provide useful data. There are two approaches that can be followed in conducting power circulating gear scuffing tests. The one frequently cited in the literature (e.g., FZG scuffing test) is to establish lubrication conditions and test speeds conducive to scuffing, and then to progressively increase the load on each specimen until it scuffs. The result of this test is the load that precipitates scuffing. The other method is to establish load and speed conditions where the gear runs properly, and then to progressively increase lubricant temperature until scuffing occurs. The result of this test is the lubricant temperature that precipitates scuffing. The tests reported here were conducted following the second approach; it was selected for these tests for the following reasons. Any given profile modification on a gearset results in optimum contact for a comparatively narrow load range. As load is increased progressively above this range, the tip of the driven gear contacts the start of active profile (SAP) on the drive gear at a progressively increasing angle to the tangent to the surface. 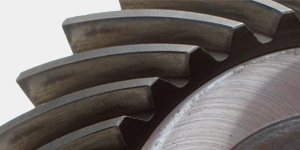 Thus, the corner of the tip of the driven gear tries to dig into the surface of the driving gear causing the lubricant film to break down and scuffing to occur. The result is partly an indication of the lubricant temperature at the point of contact where scuffing occurs, and partly an indication of the resistance of the material to being gouged out under non-conjugate contact. This situation is at variance with what precipitates scuffing in an otherwise properly designed gear mesh. The more useful piece of data for the gear designer is the temperature of the lubricant film at which scuffing occurs under given load and speed conditions. The test rig used in these tests requires two sets of specimen gears, and conducts two tests simultaneously. In the progressively increasing load type of test, the specimen set that does not scuff will be damaged by non-conjugate contact at the SAP on the driving gear caused by being run at the overload that precipitated scuffing on the other gearset. As the next gearset on the other end of the test rig is broken in and run at the lower load steps, this damage may be smoothed over by the repeated contact under less severe conditions, prejudicing the test result. It was expected that with the increasing temperature approach there would be no damage until scuffing started, after which it would progress rapidly to complete failure. Thus, on gearsets that do not scuff, there would be no smoothed-over damage to prejudice the result of the next test. With the test rig used in these tests, load is applied by twisting the shafts against each other and locking them in position with a loading coupling. This is a manual operation performed when the machine is stopped. Thus, conducting a series of tests using the method of progressively increasing the load in numerous steps for each would be a labor-intensive effort. Also, as the load was increased, getting past the resonance at 3200 rpm without scuffing the gears would become more problematic, complicating the test procedure. The critical value to be determined from these tests is the lubricant temperature at the mesh that precipitates scuffing. The temperature control system on the test rig monitors and controls lubricant temperature based on the stream supplied to the mesh. Based on lubricant flow and estimated efficiency, this allows an estimate to be made of the lubricant temperature at the mesh. When the rig is run at speed the lubricant coming out of the mesh is dispersed as a fine mist. For the scuffing tests reported here, sheet metal collectors were fitted around the gears in an effort to capture some of the lubricant coming out of mesh. The temperature of these collectors was monitored with thermocouples to provide an approximation of the lubricant temperature coming out of mesh. Knowing the lubricant temperature supplied to the mesh and an approximation of the temperature coming out of mesh allows a much better estimate of the temperature at the mesh that precipitates scuffing. The test rig was originally fit with a 3 KW 240 volt electric heater to heat the lubricant to test temperature. The voltage rating of the heater was based on the power supply available when the machine was first assembled. The power supply currently available is 208 volt, causing the heater to develop only ¾ of its rated heat capacity. This limited the maximum temperature to 225°F at the point lubricant was supplied to the gear mesh. This was not enough to precipitate scuffing with isotropic superfinished specimens. This heater was replaced with the largest one feasible; 3.75 KW rated at 208 volt power supply, which allowed testing at higher temperatures. The rig was originally fit with a safety interlock that prevented the reservoir temperature from exceeding 200°F. This was replaced with a programmable controller that allowed the reservoir temperature to be increased high enough to provide 300°F lubricant to the mesh. This 300°F limit was intended to ensure that the lubricant will at all times be kept below its 505°F flash temperature. After the four setup tests with baseline (final ground) gears were completed, a total of four additional tests were conducted with baseline gears following the procedure developed. In three of these, the gears scuffed during run-up to speed. At this point it was discovered that the baseline test gears being used were actually mixed Pyrowear®53 and SAE 9310. All baseline tests up to this point had been conducted with one Pyrowear®53 gear mated with one SAE 9310 gear. Since the SAE 9310 was the weaker link, these setup tests had established test conditions for SAE 9310 test gears. 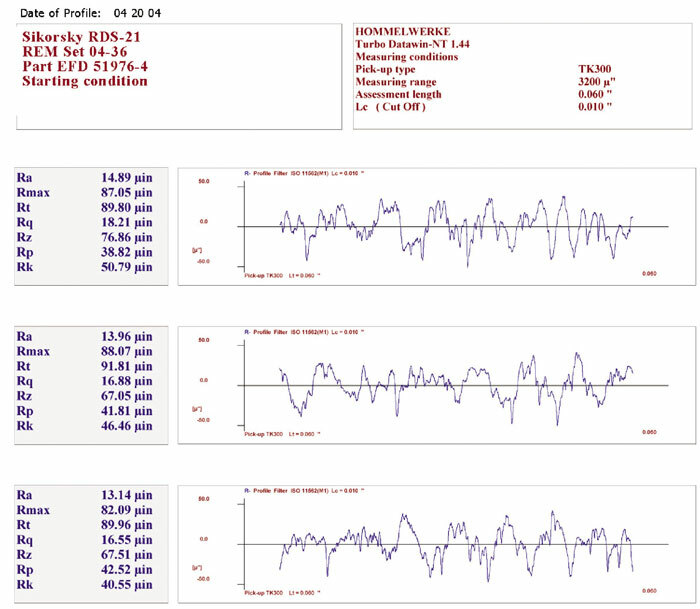 Since three of the four baseline samples did not survive past the run-in cycle or run up to testing speed, it was decided to lower the contact stress levels on the next two baseline runs. 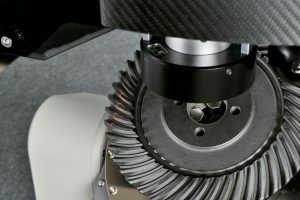 The contact stress was then reduced to 260 KSI and two tests using baseline SAE 9310 gears mated with baseline SAE 9310 gears resulted in normal scuffing failures after the run-in cycle. See Figure 4 for an image of a scuffed surface after testing. The contact stress was increased back to 285 KSI and two tests were conducted with isotropic superfinish SAE 9310 gears mated to isotropic superfinish SAE 9310 gears. The first resulted in a scuffing failure at a higher lubricant temperature than the baseline gears, the other did not scuff even with 315°F lubricant being supplied, but finally did scuff slightly during spin-down after the test was complete. See Figure 5 for an image of the second isotropic superfinish test, which only scuffed after testing was complete. Detailed results for all the tests are shown in Table 2 . The isotropic superfinish process is a commercially available process that, when applied to helicopter transmission gears, can result in improved gear tooth bending and contact fatigue resistance as well as reduced noise, vibration, and operating temperatures. The isotropic superfinish process provides a uniform surface finish by reducing the peaks on the surface through the use of chemically accelerated vibratory finishing. 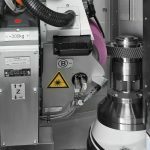 In this testing, the isotropic superfinish process has proven that precision ground gears made of SAE 9310 can be finished to a surface roughness of approximately 3.0 microinches Ra while removing only a small amount of stock. Due to the process uniformity and small amount of stock removal, no detrimental effects were seen on the gear’s geometry. In fact, the measured gear met all drawing specifications. The testing results to date have also demonstrated that the isotropic superfinish SAE 9310 gears were able to withstand at least 60°F higher lubricant supply temperature at the point of scuffing than that of their baseline counterparts when tested at the same contact stress loadings. The isotropic superfinish gears were also able to withstand more than 29°F higher lubricant supply temperature at the point of scuffing while operating at higher contact stress loading. With this improved scuffing resistance data, new transmission designs incorporating isotropic superfinish gears can now be optimized for gear tooth strength and lubrication requirements, thus improving the overall power density. 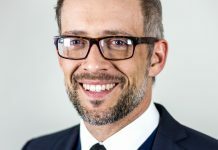 It is expected that the results obtained during this project will indeed lead to the further implementation of isotropic superfinish technology. 1) Chemically Accelerated Vibratory Finishing for the Virtual Elimination of Wear and Pitting for Steel Gears, L. Winkelmann, M. Michaud, G. Sroka, A. Alan Swiglo, and D. Mahan, AGMA, 01FTM07, 2001. 2) Reducing Wear with Superfinish Technology, P. Niskanen, A.Manesh, R.Morgan, AMPTIAC Quarterly, Volume 7, Number 1, 2003, pp 3-9. 3) Reduced Total Ownership Cost for Superfinished Dynamic Components, J. Collis, H. Proffitt, Joint Council On Aging Aircraft, Aging Aircraft Conference 2005-The 8th Joint NASA/FAA/DOD Conference On Aging Aircraft, Presentation Number 02-0800-Collis, January 31-February 3, 2005, Palm Springs, California, Slides 22-45. 4) Vibro-Acoustic Effects of Friction in Gears: An Experimental Investigation, D. Houser, M. Vaishya and J. Sorenson. 2001 SAE Noise & Vibration Conference & Exposition, Traverse City, MI, 2001-01-1516, April 2001. 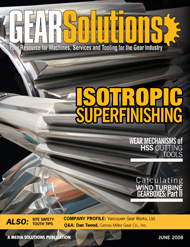 5) Superfinishing Gears-The State of the Art, G. Sroka, L. Winkelmann, Gear Technology, Vol. 20, No. 6, November/December, 2003, pp. 28-33. 6) The Effect of Chemically Accelerated Vibratory Finishing on Gear Metrology, J. Arvin, A. Manesh, M. Michaud, G. Sroka, L. Winkelmann, AGMA Paper 02FTM1, AGMA Fall Technical Meeting, St. Louis, MO, October 2002. 7) Metrology Evaluation of Superfinished Gears for Aerospace Applications, A. Manesh, D. Mahan, J. Arvin, G. Sroka, Proceedings of Defense Manufacturing Conference (DMC), Foundation for Global Security, Las Vegas, Nevada, November, 2001. Printed with permission of the copyright holder, the American Gear Manufacturers Association, 500 Montgomery Street, Suite 350, Alexandria, Virginia 22314-1560. Statements presented in this paper are those of the authors and may not represent the position or opinion of the AGMA [www.agma.org]. is with Sikorsky Aircraft of Stratford, Connecticut. To learn more go to [www.grc.nasa.gov]. is with Alion Science and Technology [www.alionscience.com].